The AN/TPS-70 3D phased array radar is a mobile S-Band radar designed to detect and track hostile aircraft in a variety of environments at ranges out to 450 km. It is the successor of AN/TPS-43. The TPS-70 radar can provide both raw (plots) and processed (tracks) data. Radar data processing involves the acquisition of raw and processed data from the radars, clutter filtering, track filtering, and sensor data fusion for a multi-radar version. 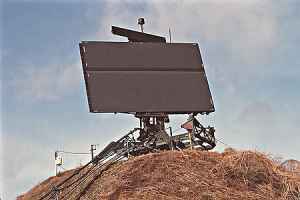 The TPS-70 tactical radar provides reliability, sensitivity, and accuracy, even in the face of jamming and high-clutter conditions. The transmitted pulse is intrapulse modulated using quadrature phase-shift keying. Thus the radar can localize targets within the 6.5 microseconds long transmit pulse. The antenna, a flat-slotted array measuring 5.5 m wide by 2.54 m high. There are 36 waveguides in array with 98 slots per waveguide. A multiple beam architecture with an entire redundant channel is employed, scanning all elevations and ranges simultaneously for targets by means of six beams. This ensures more hits per target for optimum clutter rejection and target extraction. The AN/TPS-70 provides an automated system interface for digitised target reports in either plot or track format. The plot extractor performs automatic clutter mapping, radar plot extraction, Identification Friend-or-Foe (IFF) decoding/plot extraction, radar/IFF correlation and clutter filtering. A single correlated range/azimuth report is transmitted for each detected target. The tracker automatically initiates and maintains up to 500 simultaneous target tracks. The tracker adds target identity, heading, speed and track quality information. All systems controls are entered through a touch-sensitive plasma control terminal. Over 100 separate menus arranged in user-friendly formats allow complete operator control of operating modes, parameters, monitoring of critical functions and automatic fault isolation. Each radar is equipped with two plasma displays. One is located over the operator, with the other in the rear of the shelter for maintenance purposes. The complete system consists of the main antenna, with a secondary antenna mounted on top and an operations/electronics cabin standard shelter unit. For ease of transport the AN/TPS-70 is deployed as two modules which can be carried to a forward position by truck, aircraft or helicopter.